The Times, the daily London newspaper to which Vivien Leigh subscribed, carried no news of the Academy Awards, although from 1937, as she followed its ongoing report of the epic, two-year global casting search David O. Selznick conducted to find the right actress to play Scarlett O’Hara in Gone With the Wind, she acquired the necessary characteristic to clinch the part—blind ambition. I HAVE NO ENTHUSIASM FOR VIVIEN LEIGH, wrote Selznick in a February 1937 cable he sent to Kay Brown, his New York production executive, initially rejecting Leigh. John Gliddon, Leigh’s agent, relayed the news, but she took it in stride. Leigh, obsessed by Margaret Mitchell’s fictional Southernbelle heroine, was convinced the role was hers. 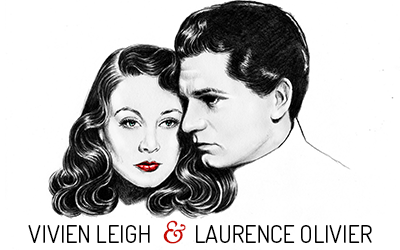 RADA-trained Leigh’s film career was minor, but she was a member of London’s Old Vic theater troupe and could hold her own onstage with her lover, the actor Laurence Olivier. A Vogue regular (Cecil Beaton often photographed her for the British edition), she had bright green eyes that lit up her face just like Scarlett O’Hara’s. Leigh’s piercing beauty prompted Myron Selznick, Olivier’s agent, to arrange for her to meet his brother, David. So in December 1938 Leigh crossed the Atlantic, and through the stormy passage aboard the Queen Mary she practiced Scarlett’s feline expressions into a makeup mirror and made notes on the tumultuous era through which she’d lived. On December 10, Leigh, Myron, and Olivier arrived at Selznick Studios to watch the first night of Wind’s production—the pivotal burning-of-Atlanta scene. “Before the fire had died down, Vivien had stepped, phoenix-like out of the embers and presented herself to David O. Selznick,” wrote Alexander Walker in Vivien: The Life of Vivien Leigh. Legend has it that just as Leigh uttered, “Good evening, Mr. Selznick,” a breeze blew open her chocolate brown mink coat, revealing her slight frame clad in a becoming beige silk dress that clung to her Scarlett O’Hara–narrow waist. A professional makeup artist had also beautified Leigh to resemble Scarlett. “Her eyes were lined with deep green shadow, making them seem more catlike than usual,” noted biographer Anne Edwards. Gruff, thirty-six-year-old Selznick was a snob and not easily impressed. But Leigh walked off his studio lot with the part she so longed for. “I took one look and knew she was right,” recalled Selznick, who soon authorized Leigh’s winning screen test. “Her tests showed that she could act the part right down to the ground, but I’ll never recover from that first look.” By February 1939, two weeks into work on Wind, Leigh regretted her careerist determination. Selznick had abruptly fired Wind’s director, George Cukor, with whom he ceaselessly argued, appointing Victor Fleming as his successor. Fleming and Selznick agreed a heaving cleavage would be necessary for Leigh to effectively portray Scarlett. The pair envisioned a “tougher . . . more dangerous” Scarlett than the “tender wanton” Cukor had imagined. Trouble was, Leigh’s flat chest had gone undetected during her screen test and preproduction. But before Fleming’s cameras, the tops of Scarlett’s antebellum gowns caved in, most especially the long, burgundy velvet dress her husband, Rhett Butler, in a jealous rage, forces her to wear to the birthday celebration of her beloved Ashley Wilkes. “Wear that!” Rhett orders Scarlett, removing it from her bedroom wardrobe and tossing it at her….So on Selznick’s command, Fleming insisted that Walter Plunkett, Wind’s costumer, bind Leigh’s breasts together with adhesive tape. “Dear Vivien stood patiently while we pushed her breasts together and a fitter strapped adhesive tape to keep them in that uncomfortable position,” recalled Plunkett. Talented Plunkett, Hollywood’s leading authority on period costume, could have whipped up Leigh’s Oscar fashion dream in the “garment factory” he operated on the back lot of Selznick Studios, where over two years his team produced the fifty-five hundred costumes that made up Wind’s wardrobe. “It took countless people,” he recalled. “I had two women to assist me, cutters and fitters, each of whom had their own crew of seamstresses, plus a crew of milliners. Almost everything was made from scratch.” Experts skilled in corset making, hoopskirt production, and pleating fashioned Scarlett’s wardrobe from bolts of pretty calico, jewel-toned silk velvets, and French petticoat lace—textiles explicitly produced in small, costly quantities by obscure mills Plunkett discovered, after intensive research. It has long been assumed that Plunkett designed Leigh’s Oscar dress, but when Wind ceased, she stepped out of his costumes for good. Leigh and Plunkett’s relationship was based on mutual adoration, but she grew resentful of the attention her upper proportions generated once clad in his work, as well as Selznick’s exacting standards. Intensifying Selznick’s perfectionism was his propensity to ingest energy-inducing artificial stimulants, principally the prescription drug Benzedrine, which Evelyn Keyes, who played Suellen, Scarlett’s younger sister, watched him swallow “like popcorn.” Consequently Wind became a nightmare project for its cast and crew, but most especially for Leigh. Venting her rage about the trials of film acting, Leigh wrote letters to her mother, Gertrude, and her husband, Leigh Holman, with whom she remained on amicable terms despite their impending divorce. Shooting, she related to Holman, operated “at a snail’s pace” and was “exhausting and miserable.” She compared the rules and regulations that governed her life in Hollywood to those she’d endured at the string of boarding schools she’d attended in England and on the Continent. She felt like a prisoner in the North Camden Drive, Beverly Hills, home Selznick rented for her and arranged for it to be watched by a twenty-four-hour guard so that her relationship with Olivier could be kept top secret. In London, Leigh and Olivier lived together openly. In Hollywood, Selznick feared a similar domestic setup might prove gossip fodder and create a scandal that could jeopardize Wind’s success. So after filming Wuthering Heights, Olivier moved to New York to appear in a Broadway production of S. N. Behrman’s No Time for Comedy, an assignment Leigh’s biographers claimed Selznick arranged to keep the lovers apart. Selznick made up for his bad behavior on Wind’s set by picking up the tab for the wardrobe custom-made by Irene Gibbons for Leigh and all the women appearing at the series of gala premieres and after parties feting Wind’s December 1939 release in Atlanta, New York, and Los Angeles. “Irene” was the couturier who operated the French Salon, the exclusive ladies’ dress department at Bullock’s Wilshire, the downtown Los Angeles luxury department store. While Irene fitted Leigh with an ermine-tipped, black velvet gown and golden tulle ensemble for Wind premieres, Leigh discovered in the designer’s spring 1940 collection what became her Oscar dress. 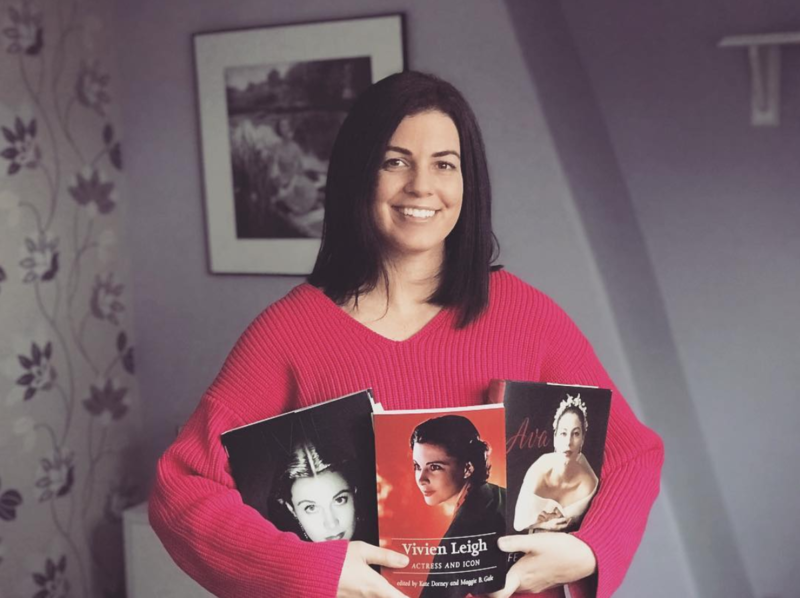 Leigh’s Oscar bid—one among an unprecedented total of thirteen nominations Wind received—factored onto a list made up of box office draws, including Bette Davis, Greta Garbo, Greer Garson, and Irene Dunne. Vying for her third Oscar with her laudatory performance in Dark Victory, Davis was considered Leigh’s only challenger. Beneath the swaggering crystal chandeliers in Bullock’s art deco–accented French Salon hung Irene’s evening gowns. Cut from exotic Bianchini printed silk, adorned with fourteen-karat gold buttons, and generously slit, they carried the fashion industry’s highest price tags. At $450 each, her gowns were over twice the price of a Paris couture model. But cost seemed irrelevant to Irene’s customers. “I should have ordered more dresses!” wrote Marlene Dietrich on the back of a Paris postcard she sent Irene after a Bullock’s shopping spree. “Every star and social butterfly who could afford her prices went to Irene,” recalled fashion photographer John Engstead. Every piece of clothing owned by Edie Goetz, David Selznick’s discerning sister-in-law, came from Irene’s atelier, including the skirts she wore playing tennis on the court behind her Bel Air mansion. Carole Lombard tied the knot with Clark Gable in March 1939 in an Irene gray flannel skirt suit. She planned to attend the early fall 1940 show the couturier staged in September 1939 to scout for pieces for Wind’s premieres, but she was busy working. “I’m damn mad that I can’t get to the show,” wrote Lombard, who sent regrets by a note typed on her emerald-green-embossed personal stationery. “You better save a lot of good things for me or we will have to do originals.” Irene, however, set aside the best dress for Leigh. Leigh adored flowers. They brought to mind fond childhood memories of times spent with her mother in the vast garden behind their family mansion in Calcutta. Leigh had lived there happily until her parents sent her off to a string of continental boarding schools. Throughout her life, gardens and wildflowers brought her comfort. “A garden for her had qualities of beauty and tranquillity,” observed Alexander Walker. “In whichever parts of the world she later found herself, ‘the garden’ was present or re-created in the bouquets on first nights, in vases arranged to welcome her to strange hotel suites, in flower paintings by French Impressionists which traveled with her in her luggage and were then stood on bedside tables or hung on the walls of rented apartments to turn them into a reminder of home, the minute she opened her eyes.” As Leigh’s travails with Selznick and Fleming intensified on Wind’s set, she retreated to the rambling, terraced garden behind George Cukor’s Beverly Hills mansion. Surrounded by its high, wisteria-and-ivy-covered walls, Cukor and Leigh reclined side by side on padded pool loungers most every Sunday, her day off, commiserating about Wind’s chaos. Cukor’s garden became Leigh’s haven, and on Oscar night, Irene’s dress was its equivalent rendered in silk. On the night of the twelfth Academy Awards, between Red Poppy Evening Gown and Leigh’s skin mingled merely the rose and jasmine scent of Jean Patou’s Joy, her favorite perfume. She splashed it on and fastened an aquamarine pendant. Olivier had purchased the semiprecious piece in New York from Van Cleef & Arpels, the Fifth Avenue jeweler, and sent it to Leigh in Los Angeles as a token of his affection as she suffered through Wind. On Oscar night it hung from a long gold chain and drew attention to the plunging bodice of Irene’s dress. Like a trophy medallion, it displayed that after a tough seven months of portraying Scarlett O’Hara, Leigh was finally free. She and Olivier set off by limousine to a pre–Academy Awards cocktail party at David Selznick’s sprawling home on Summit Drive. “Everybody was keyed up—they all came in limousines,” recalled Irene Mayer Selznick, David’s wife. Celebrating at Selznick’s lofty abode, Leigh discovered she had won an Academy Award. In banner headlines, the Los Angeles Times’ early edition published results it was meant to print the following day—Wind had set an Academy record, winning an unprecedented nine Oscars. Supercharged by the news, Selznick hustled Leigh, Olivier, Clark Gable, and Olivia de Havilland into the back of a limousine bound for the ceremony at the Ambassador Hotel’s nightclub, the Cocoanut Grove. The Twelfth Academy Awards, February 29, 1940. Veiled in stardust, gowned by Irene, Leigh was ushered into the Ambassador’s lobby by David Selznick as a “near riot of admirers” rushed toward them, wrote Variety’s Alta Durant. Leigh, noted the columnist, was the “star” of an illustrious Academy Awards. “Every name of note in the industry was either a guest or host,” observed the Hollywood Reporter. Bob Hope was debuting as master of ceremonies, a post he would mostly maintain over the next thirty years. Actor Spencer Tracy had arranged to be discharged from the hospital so that he could be on hand to present the Oscar to Leigh. After MGM’s teen queen Judy Garland, recipient of a special juvenile Oscar for her outstanding performance as Dorothy in The Wizard of Oz, sang “Over the Rainbow, ” its Academy Award–winning theme, Hope entertained the crowd. “What a wonderful thing this benefit for David Selznick,” he cracked. Journeying home by limousine was no pleasure cruise. Laurence Olivier qualified as an actor Academy Award nominee for Wuthering Heights, but he lost out to Goodbye, Mr. Chips’ Robert Donat. In the back of the limo, as Olivier sat next to Leigh, he grabbed her Oscar and later admitted, “I was insane with jealousy. It was all I could do to restrain myself from hitting her with it.” Life captured Leigh arriving home, where she placed her Oscar atop the mantel above her fireplace.